Venezuela imports heavy crude used to refine diesel fuel. All that new light crude that we are pulling out of our own soil through fracking is mainly used to make gasoline. There was a reason I said to focus on a particular date: March 1st. It’s the China trade deal... the only thing markets care about right now. Let’s break it down and understand how important this is, or really, isn't. I was asked by the producers at Fox Business to give my reaction about Amazon pulling out of their New York second headquarters expansion. But I'm a cynic. What does Venezuela have to do with the price at the pump? I was asked to discuss the troubling events in Venezuela. Fox Business producers simply wanted to know: how does this affect the average American investor? Description: Took a one person office to three offices across the southwest. After spending 14 hours a day building a business, I decided my time was better spent managing money for clients. In 2011 Lorraine Ell was put in charge of the day to day as COO of the firm. Since then we are bigger, more profitable across the table, and happier. Description: Built and managed custom portfolios for high net worth individuals. Key trader for TFC Advisors, LLC and The Mother Lode Fund, LLC. Specialized in option strategies. Developed hedging strategies for institutional stock positions. Created monitization strategies for insiders in public companies. Description: Rigged Money: Beating Wall Street at Its Own Game explains in detail how the financial industry has systematically worked to convince the public that investing across different asset classes is the only way to protect wealth. At one point this was probably sage advice, but today it's an outdated rule more likely to bring disaster than success. Since asset classes—from small caps and international stocks to gold and bonds—now overlap when it comes to risk and volatility parameters, the diversification effect is gone, and with it, any reason for spreading your money around. 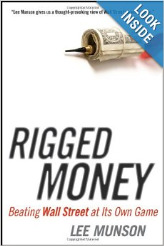 It's this change in the financial landscape, and the rules of the game, that Wall Street doesn't want you to know about, and that this book discusses.